assigned to a beneficiary for other purposes including downloading the data for use on other sites or using your test sample for further DNA testing. I’m going to use italics to detail my own experiences with this, so you can skip the italicized print if it doesn’t interest you. I’m the executor of my uncle’s estate so for the last two years I’ve been dealing with digital account access during a time when not many people have specified how they want their digital data handled. Digital accounts include email, banking, social media, DNA accounts, etc. My uncle did a Y-DNA test at FamilyTree DNA at the request of his sister, who manages the account. She and I both agree he would have done an autosomal DNA test if we’d asked, so with her as the manager of his account and me the executor of his estate, we’ve requested FTDNA use his test sample and perform an atDNA test on that sample. FamilyTree DNA asked me to send them my uncle’s death certificate and the legal papers proving I was appointed the executor of his estate, then they sent an email to my aunt, the manager of his account, stating they’d received a request to use his sample for further testing. She replied that she agreed with that decision and FamilyTree DNA will now use my uncle’s 5-year-old DNA sample for an autosomal DNA test. And an aside, they said that 5 years is the outer limit of a DNA sample being successfully used for further testing. 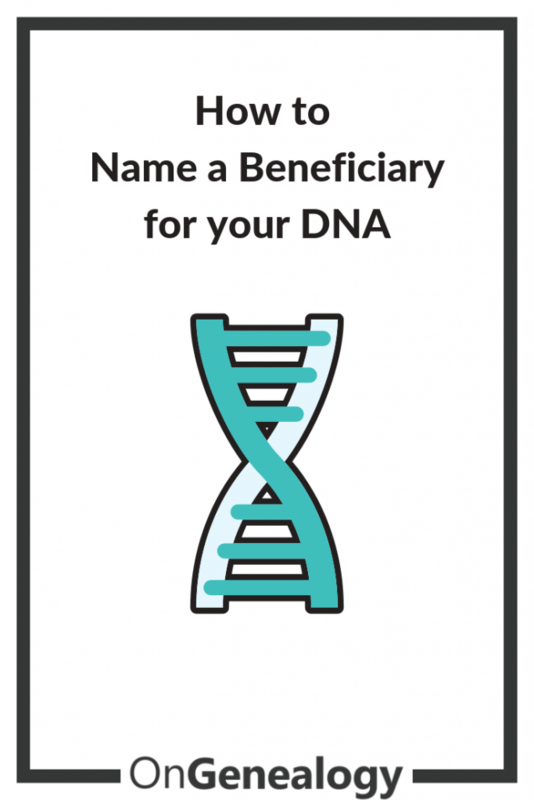 How To Name a Beneficiary for Your DNA. This step isn’t absolutely necessary, but the following steps are. The Account Settings menu by default opens to a Contact Information page. Add a beneficiary’s email address in the contact information. Be sure your name is the primary email address that will receive the primary email (you want your email address to be checkmarked). The secondary address (beneficiary’s email) will be used if the first address becomes disabled or non-responsive at some time. Open the Beneficiary Information menu to the right of Contact Information, still under the Account Information page. On the Beneficiary Information menu, fill in the name, phone number, and email address of your beneficiary and select Save. On the Beneficiary Information menu, once you’ve filled in the contact information and beneficiary information, it pre-populates a Beneficiary form with details of how you are directing FTDNA to handle your DNA sample after you die. Print this form and have it legally notarized and put it with your will/trust/other estate documents. FTDNA states this may not be legally binding everywhere. FTDNA doesn’t need to see this notarized form to honor your wishes, it’s just a detail to add to your estate planning paperwork so your estate has a printed version of your wishes. If you don’t complete the beneficiary information before you die, your executor can send FTDNA a copy of your death certificate and legal documents showing they are the executor of your estate and they will be given control of your account. I was also the executor of an estate in the 1980s, prior to the digital age. There were more safeguards in the 1980s than there are at present for gaining access to a deceased person’s assets and physical accounts. I had to provide certified copies of a death certificate and notarized copies of letters from the court appointing me the executor of an estate before any bank or institution would let me access someone else’s account. Today, all I really need to access someone’s account is a login and password. Whether someone is alive or dead, that’s all you need unless they’ve set up two-factor authentication. It’s quite an eye-opener being the executor of an estate in this digital age. With my uncle’s printed list of accounts, logins, and passwords I can see his email, bank statements, social media accounts, and yes, even his DNA account. I’m an honest person and respect his privacy so I have no interest in exploiting any of his data or perusing his emails any more than necessary to manage his estate, but it frightens me to consider how someone could abuse this power. 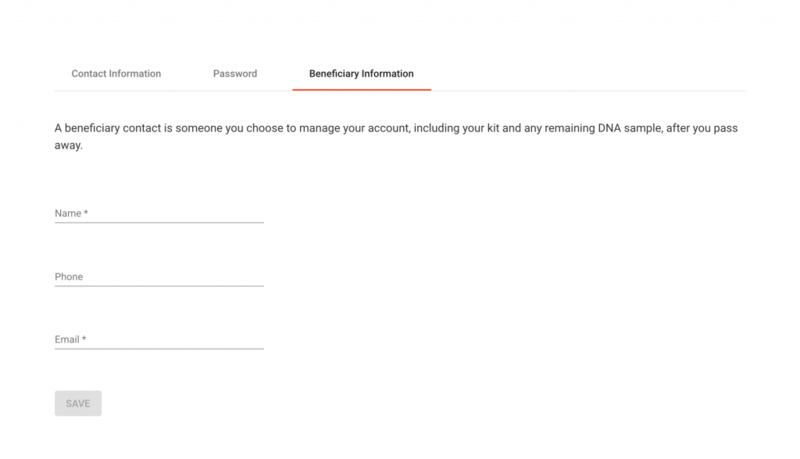 That’s another blog post but for my purposes today I just wanted to share how you can, on at least one DNA test site, specifically name a beneficiary for your DNA and account management. What if my uncle didn’t want his DNA used for an autosomal DNA test? What if he didn’t want it uploaded to GEDMatch or another DNA test site? Without written instructions from him, I get to decide how to manage his DNA. The implications are frightening if you have strong feelings one way or another and you don’t take the time to detail them in a legally binding will. Even with the named-beneficiary set up at FamilyTree DNA, it makes sense to include in your will what you want to have happen to your DNA and other digital assets.